Now this guy's definitely got one of the shortest names in the set. Everything about this set is short for Hal King: his career as this is his final card; his stat line - only 43 at bats; his ability to smile - in not one photo I found while researching for this post is there one with even a hint; and apparently his batting helmet as it can't fit over his afro at Candlestick. But in some ways Hal's '73 was a big deal. His first three hits in the season were all homers and of his eight hits for the year half were four-baggers. The big one came on July 1. When the game that day began the Reds were only a few games over .500 and eleven back from the division-leading Dodgers. LA was up 3-1 in the bottom of the ninth when Hal pinch hit with two on and two outs. He popped a Don Sutton pitch over the wall for a 4-3 win. From that game on the Reds were 60-26 and the homer was viewed as a catalyst for the run. Hal had two other game-winners down the stretch so the one thing he wasn't short on that season was late-inning dramas. 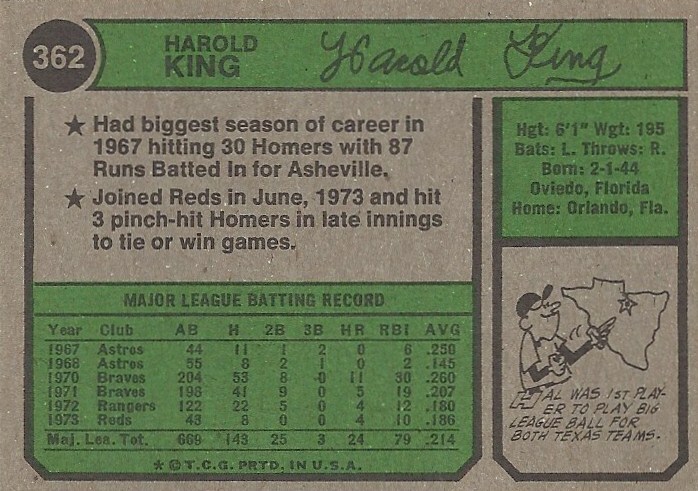 Hal King hailed from Oviedo, Florida where he played pretty much every position on the field. He'd have been done with high school in '62 but he wasn't signed until '65 when the Angels picked him up as a free agent. It seems he didn't go to college so what he did during the intervening years is a mystery, but it certainly got him noticed in baseball. That summer he played outfield and even pitched a bit in A ball, hitting .241. In '66 he served some time in the military and had a short season at catcher split between a couple Double A teams. After the season he was selected by the Astros in the minor league draft. Houston was pretty desperate for catchers and after Hal had a big offensive year in A ball - .288 with 30 homers and 87 RBI's - he was pushed all the way up for a late-season look. For the '68 season he was named the starting catcher but after a poor start he returned to the minors and split the year between Double and Triple A, hitting .253 with not nearly as much power as he showed in '67. He nearly ended the career of Billy Grabarkewitz in a collision that summer at home plate. In '69 spring training he went to the Red Sox for another minor leaguer. For Boston, King put together a nice season in Triple A, batting .322 with a .421 OBA and some decent power. But that December the Sox, flush with young catchers, left Hal unprotected in the Rule 5 draft and the Braves nabbed him. Hal was lucky enough to get there in the window of opportunity between Joe Torre and Earl Williams and in '70 he had his busiest season in the majors, putting up pretty good offensive numbers. 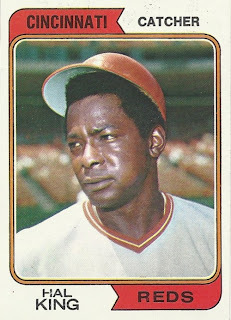 While he got nearly as many at bats in '71 his stats came down pretty hard and after the season he went to Washington/Texas for Paul Casanova, another catcher. Manager Ted Williams was impressed enough with Hal in training camp but when his average stayed below .200 during the early part of the season he was sent back down to Triple A. After the year he went to the Reds for former 20-game winner Jim Merritt. In Cincinnati King's career took its familiar arc. Sent in spring training to the minors, he returned in late June to hit his well-placed homers. He went one for two in the playoffs against the Mets. '74 would be pretty much the same deal with a lot more time in the minors and no homers up top. It would be his last year of play in the States. Up top Hal hit .214 with 24 homers and 82 RBI's in what amounted to just over a full season. He had a .325 OBA. In the minors he hit .270 with 72 homers and a .360 OBA. In '75 King was sold to Cordoba in the Mexican League. He would do pretty well south of the border, hitting at or above .300 each of the next four seasons with some pretty good power. In '79, which may or may not have been his final season there, he played for Saltillo, a team that went 95-40 and was led by former Orioles outfielder Andres Mora. For Saltillo that year Hal hit .320 with 19 homers, 85 RBI's, and a league-leading 124 walks. Since then there is virtually no news out there on Hal except wistful notes about his '73 homers. Back in his hometown of Oviedo there is a Hal King Power Washing business that also performs other home-related services. It's probably not a stretch to think this may be the same guy. Hal may have the most room I've yet seen in the top name plate since he has no middle name. There are his homers. That cartoon is an interesting tidbit but that's one of the worst drawings of Texas I've ever seen. 2. Stanhouse and Don Carrithers '75 to '76 Expos.